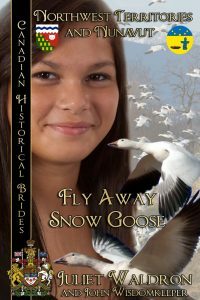 Juliet Waldron and John Wisdomkeeper teamed up to write this story. John wanted to tackle this difficult topic, as he himself was removed from his birth family during the "60's Scoop," so was personally affected by Canada's Indian policies. When John and his wife, author Jude Pittman, suggested that I assist with this project, I got right on board. As soon as I began the research, I understood that not only was this a story which should be told, but one which should be, as much as possible, told from a 1st Nation's POV. I had a lot of research to do, both on the Tlicho tribe from which the characters are drawn, but on the immense Northwest Territories. John suggested the names and from the names we drew their characteristics, their strengths and weaknesses. "Yaotl" or "warrior" is the oldest girl and she is also the most frequent narrator. "Sascho" or "grizzly bear" is the name of the oldest boy, who is growing up fast and is discovering that he loves her. "Kele" or "hawk" is a boastful younger boy and gentle "Tanis" is his "Little Sister." Yaot’l’d had enough of scraping moose hide. She and her aunts had, off and on, been at it for a day and a half. Her thin arms ached, upward from the wrist and somehow, from there, straight into the back of her neck. It took a long time to scrape such a vast expanse clear of bits of flesh and fine silver skin. Granma Josette had set her to work as soon as she and her aunts, assisted by two cousins, had the hide stretched onto a frame. Building the frame, too, had been a project, but one completed yesterday. With spring thaw underway, the Snow Goose band travelled to summer fish camp, a long traverse through bush. They hauled their few possessions, the precious metal kettles and iron spikes, on their backs and on dog skids. The young moose had been an unexpected bonus; he had jammed a back leg in a tangle of wood in the shallow water near the island. In his struggles to get free the leg had broken. Fortunately the band had come upon him before the wolves did. His quick dispatch by the men had been mercy, and they’d made an offering of tobacco to thank the animal for giving up his spirit. The strips of flesh now smoked in an enclosure of peat and sticks prepared for the purpose. They’d made camp, near the little island of willows taking time to prepare and preserve their bounty. The thaw had come, as it always did, with days bringing an ever longer sun, with creeks and ponds spilling over, full of water and silver fish. There was work to do at every season, but especially now in the fishing time. Spring melt meant water everywhere, trickling through the bogs and rushing in the fullness of the streams, pooling in the pothole lakes. On the willow-covered islands where the moose had wintered, water locked inside snow and ice turned liquid again. It was still cold, enough, Yaot’l thought, to shatter her bones when her hands were in it. Today, though, the sun burned hot on her back and it seemed she’d been scraping hide forever. Pausing to stretch her arms over her head she shook her hands to remove the sticky silver skin from her fingers. Knowing the older women would tease, she glanced around, in her head she heard their voices — Ah Yaot’l! How will you ever get a good husband if you can’t prepare a fine big hide? You’re almost grown now, and no hunter wants a weak woman. Ah, but the sun beat down on her head and the water all around her sang. It would be such a good relief to take her spear and go take a stand in one of the creeks at a place where it tumbled from one level to the next, a place where the fish would jump. She could hear the sound of voices—her cousins, all down fishing already. Some kids playing, she guessed, and not working at all. She liked being older, but at the same time she didn’t. Not enough fun and a lot more work…not that she didn’t like having a full belly during winter. It was up to the women, she knew, to make sure that food was carefully stored. Granma Josette and Aunt Katie were busy nearby preparing fish. With favorite knives in hand, they gutted and sliced the Uldai, heading them first then splitting length-wise, the inner flesh scored to assist the drying process. The skin and tail remained so that the fish could be easily dried. During the long winters, dry whitefish was an invaluable staple. Yaot’l knew the weight of the wet hide, when they pulled it from the creek once more, would be great. It would take several women and children to get it back on the hanger. Then the curing would start. The brains they’d use were already rendered, the pot set aside where it wouldn’t be accidentally tipped over. “I know, Auntie.” Yaot’l cleaned her blade against a flat topped rock, and returned to the task at hand. It was said that there’d been a big river here and a bad flood, very long ago in dreamtime…Round the evening campfire, Granpa Gregorie had told them all about it in one of his “ Gawoo-long ago” stories.